Tarren, known as Tanner (タナー, Tanā) in the Japanese version is a resident of the Commons in New Domino City in the Synchro Dimension, and he is one of the three children that Crow Hogan looks after in the Yu-Gi-Oh! ARC-V anime. Full body view of Tanner. Tarren is the shortest of his foster siblings. He has short teal hair and a pink nose and cheeks to emphasize his youth. He wears a turquoise shirt, blue overalls with a patch on each knee, tan shoes without socks, and a straw hat with a white pom-pom and pink strands. Tarren, Frank and Amanda were first found by Crow Hogan in an alley at night. Crow took them in and fed them, scolding them when they ate too quickly, and adopted them. Tarren and Frank passed by a Duel between Gong Strong and Dennis McField in the park one day, which caught Tarren's attention, but Frank was uninterested in it and he urged Tarren to keep moving. As Zuzu Boyle and Yugo tried to inform the people around them about invaders from other diensions, Frank and Tarren took advantage of their distraction to steal food form a restaurant and escaped before they could be caught by Sector Security. Frank and Tarren later returned home with the stolen food, much to Crow's anger. Crow later left to look for Yuya's friend Zuzu, after Frank and Tarren confused her with Celina. While Crow was away, Frank and Tarren explained the history of Turbo Duels to Yuya and Sylvio. Shinji Weber visited the next day after Frank and Tarren had a practice Duel with snacks for the kids, and Amanda asked if he stole them, much to Shinji's shock. While they enjoyed their meal with Riley, the kids witnessed Crow and Yuya arguing over whether a smile or a full stomach was more important. Crow tried to drag them into the argument, but the kids refused to comment, and they later watched Crow and Yuya Duel. Tarren was amazed by Yuya's Pendulum Summon, and seemed to support Yuya in the Duel, despite what Crow had done for them (as Amanda and Frank cheekily pointed out). Unfortunately, Sector Security arrived, having followed Celina and Sylvio back to Crow's house, and they arrested Yuya, Sylvio, Crow, Shinji, and Celina, but let the kids off. Tarren cried Crow's name as he told them not to worry about him and eat properly. The kids snuck into the Duel Palace in order to watch Crow's Duel in the Friendship Cup against Gong Strong, but the disguise that they used fell apart as soon as they got in, forcing them to evade Palace security the entire time and causing Crow to worry about them during the Duel. They cheered Crow on as he defeated Gong, and quickly fled the palace. At some point, Frank, Amanda and Tarren watched the Duel between Shay Obsidian and Dennis McField, where he developed a dislike for Shay due to his brutal tactics. Tarren, Frank and Amanda later found Zuzu Boyle in the slums after her brutal loss to Sergey Volkov. They brought her to an overpass to see Crow and Shay's Duel, as they couldn't sneak into the Duel Palace again and the matches were now taking place around New Domino City. During the Duel, Tarren got overexcited, climbing up on the railing to cheer Crow on despite Zuzu telling him off, and eventually falling off when Shay and Crow's monsters passed underneath him. He landed on "Assault Blackwing - Raikiri the Rain Shower" struggling to hold onto its cape and eventually losing his grip, but Shay rescued him while riding his "Raidraptor - Revolution Falcon", explaining to Tarren that children had previously cheered for him before returning him to Zuzu, Frank and Amanda. Sector Security surrounded them after the Duel, and Tarren refused to abandon Zuzu to them. Fortunately they were rescued by Sora Perse, and the three children were awed by Sora and Zuzu's Tag Duel and impressed when they learned Sora that saved her. The three children learned about the invasion of the Obelisk Force when Moon Shadow arrived. Tarren, Frank, and Amanda were dismayed to learn from Moon that they also had to go with Zuzu and hide in the Underground Labor Facility. During their time in the Underground, they learned about the strange abilities of Zuzu's bracelet, which they found strange and fascinating. The three children had to tirelessly dissuade and physically prevent Zuzu from leaving the Underground several times because of her concern for Yuya. Zuzu eventually slipped away after Shay and Shinji started rioting, and the kids frantically began to search for her after they realized she escaped, and quickly alerted Gong, Chojiro Tokumatsu, and Crow. After escaping the Underground, the three children convened with Crow in an alleyway. Amanda had to talk Frank and Tarren down a few times, as Crow warned them to beware of anyone suspicious, and Amanda reminded them that they didn't have Duel Disks, so they wouldn't be able to take on their enemies. They split up from Crow to begin searching for Yuya, Zuzu, Celina, and Sora. They reunited with Yuya, Gong, and Sam during Yuya's attempt to get back to the Duel Palace. Tarren, Frank, and Amanda were shocked and saddened to hear of Celina's recapture by the Obelisk Force and led Yuya to another pathway to the Duel Palace. He, Amanda, Frank, and Sam also ended up traveling on Shay's two "Raidraptor - Force Strix", flying above New Domino City for the first time in their lives. Tarren, Frank and Amanda asked Jack Atlas to go help Crow and the others, reassuring him that he could leave New Domino City to them. Tarren, Frank and Amanda, Sam, and Chojiro witnessed the appearance of a massive dragon in a dimensional rift. They later witnessed Jack and Crow each take on Zarc, the Duelist controlling the dragon, and their subsequent defeats and that of Declan Akaba, before Zarc was finally defeated by Riley. After Zarc's defeat, Tarren is seen watching Yuya's Duel against Jack with Shinji, Damon, Tony, Amanda, Frank, Sam, Chojiro, and his lackeys. He cheered with Frank when Yuya won and watched Yuya and Declan's Action Duel. Tarren watched Yuya and Declan gather Action Cards to in order for one of them to win the Duel first due to the effect of "Performapal Five-Rainbow Magician". 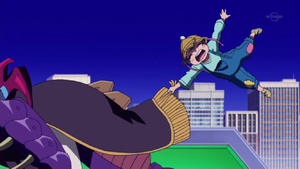 He was happy when Yuya won and was sent to the Pendulum Dimension by Ray Akaba to witness her revival as Zuzu. ↑ 1.0 1.1 Yu-Gi-Oh! ARC-V episode 57: "Super Duelists"
↑ 2.0 2.1 Yu-Gi-Oh! ARC-V episode 66: "Crow's Crew"
↑ Yu-Gi-Oh! ARC-V episode 82: "Warriors of the Air"
↑ 7.0 7.1 Yu-Gi-Oh! ARC-V episode 82: "Warriors of the Air"
↑ Yu-Gi-Oh! ARC-V episode 83: "A Matter of Trust"
↑ Yu-Gi-Oh! ARC-V episode 121: "Brand of Misfortune"
This page was last edited on 12 June 2018, at 20:20.